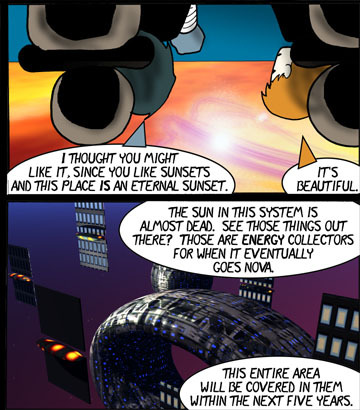 “I thought you might like it, since you like sunsets and this place is an eternal sunset.” Lexx commented, realizing that he was beginning to ramble unnecessarily. “It’s beautiful.” Chel didn’t want to blink and miss anything. It was so breathtaking to see the vapors darting in and out of the ‘clouds’ like some insane mixture of bird and fish. They moved quickly and gracefully. She had never seen anything that could compare with it. Huge flat panels drifted in space, all angled toward the sun. It reminded Chel of pictures she’d seen of fields covered in solar panels on Earth. The similarity was amazing. Reminds me of the doctor who episode where the doctor takes his companion into the future to see earths sun go nova on a space station.